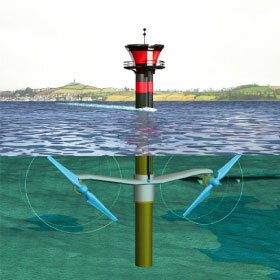 Sea Gen, the UKs first commercial-scale underwater turbine generating electricity from tidal streams, began generating electricity for the national grid on 17 July 2008. Situated at Strangford Lough, in Northern Ireland the SeaGen trial turbines generate power at 150kW, with plan to increase the power to 300kW. That's enough to power about 100 homes. The company behind SeaGen is the Bristol-based Marine Current Turbines (MCT), supported by the Department for Business, Enterprise and Regulatory Reform with a �5.2m grant, helping take its plans from the drawing board to the first demonstrator. It is thought that between 5 and 15 gigawatts of power could be generated by similar systems around the country. At present it costs �3m for every megawatt generated to install marine turbines, compared to �2.3m per megawatt for offshore wind. However enevitably the costs will drop if the technology is replicated on large scale.